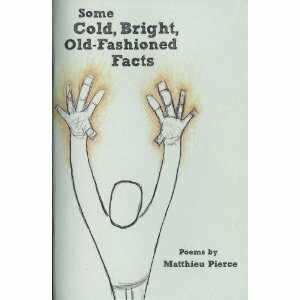 Matthieu Pierce’s debut chapbook, Some Cold, Bright, Old-Fashioned Facts, brings a fresh, modern style of poetry into the world. Every page is permeated with lyrical, fascinating poetry and even the front and back inside covers of the chapbook are adorned with poems. But what are these facts that are alluded to in the title of the work? They are short, succinct yet brilliantly clever poems that explore the environment of urban life, death, religion, and many other facets of the nuclear glowing life in the 21st century. The first several poems are hauntingly harsh, sharp views of the urban environment. For example, in “Construction”, after carefully describing a disgusting urban environment, the poem ends with the image that one’s “body is built built/by myth and trash bin.” And, in the poem “In the Gravel Parking Lot,” the finches explore cars in a parking lot and truly see these instruments in which people, “live dangerously in the moving ruins/ of your daily grind.” Not only do these two poems present strange, disturbing images of urban life, but they also explore a darker, deeper side of this lifestyle. What does it mean to be both connected to ancient life and modern life? Death and pain can be found within the subtext of these poems but not in the typical overt manner of other modern poets. From the first four poems, Pierce dives even deeper into the harsh realties of life with his poem “Apology.” The imagery in this poem can only be described as brutally harsh as the concept of an apology is compared to a crumbling and decaying mouth. The violent but almost stumbling language is jarring and incredible for the reader. Yet, from “Apology,” the tone of the chapbook seems to change and grow as the moments become even more urgent. The poem “Rusted Moose” embodies this. Here, while one still can see the sadness and decay of our modern landscape, an almost sentimental and nostalgic feeling creeps into the poem. However, these feelings do not overpower the reader with sappy sentimentalism; but instead, the power of memory is strongly conveyed throughout this poem. Pierce does not stop surprising and pleasing the reader with fresh, new images that bring his poems to life. One of the best examples of this imagery can be found in the poem “Driving Through Hartford.” The landscape from a car window is described as, “radioactive corn-on-the-cob or a plate/of creamed disco balls.” Not only does this image capture its own essence of the New England town of Hartford, but it also shows the incredibly disjointed and disconnected view one has of the environment as seen through a car window. The poem concludes by saying, “The land expands in all directions like a cartoon/written by Dickens, drawn by Dali, and colored by Klee.” This simile is a powerful literary and art connection to the words on the page and proves the author’s fine mastery of language. With these five short lines, an entire character comes to life for the reader. Here, Pierce masterfully maximizes his language and creates so much in so few words. Later, death is personified in “The Way Grandpa Describes Him.” Such a poem runs the risk of being clichéd or unoriginality, but with the final line, “his eyes, which are blue, and kind, are the best you’ve ever seen” the reader is given a unique, fresh view of this character often personified throughout literature and poetry—Death—in an incredible way. This line sends chills down one’s spine. The persona poems continue to get eerier and eerier with the poem “Mannequin,” a strange look at the “life” of this inanimate and spooky object. These intimate views into ordinary people, concepts, and objects are transformative for the reader. Yet, even with these portraits, Pierce returns repeatedly to poems about the urban life. He explores nature and the relationship between people and the world around them. One of the most apt metaphors he uses for this is in “Hidden Crickets”: as a grasshopper is a beggar asking the speaker for change, but like the beggar, the speaker also has none to spare. Another strange juxtaposition between urban life and nature can be found within the poem “Urban Scarecrow.” One can vividly see the bleak, dirty urban landscape over which this scarecrow would preside. The poems of urban America with their loss of the natural world are some of the strongest within the collection of poems and come alive to the reader. As the collection continues, the reader is given a glimpse into the world of childhood and the transformation into adulthood without resorting to clichéd stereotypes of growing older. A sad, poignant example of the loss of childhood and the innocent joy it creates can be found in “Prerequisite for Adulthood. The poem is commanding as it tells the reader, “forget these scraps of low-born magic, playground prestidigitation;/they sully up your dry-cleaned money, and money moves the nation.” In that moment, all loss of childhood comes flooding back to the reader in a moment of sad, shame. But then the poem continues and almost whispers to the reader, “(Reverse all this. Remember dandelion puffs, and starburnt/ summer rains)”. This poem is an incredible example of the authors ability to fit so many different emotions into a poem, yet gives the reader a hopeful, poignant feeling by the end of the poem. The poems within Some Cold, Bright, Old-Fashioned Facts, almost seem to jump all over at first glance, from one subject matter and tone to another. Yet, with close examination one can see they all progress smoothly from one to the next. As Pierce describes it, “the kid gloves are off,” these poems are studies of our human condition and life trapped in the modern, urban landscape with each is its own portrait of this life and the individuals contained within it.